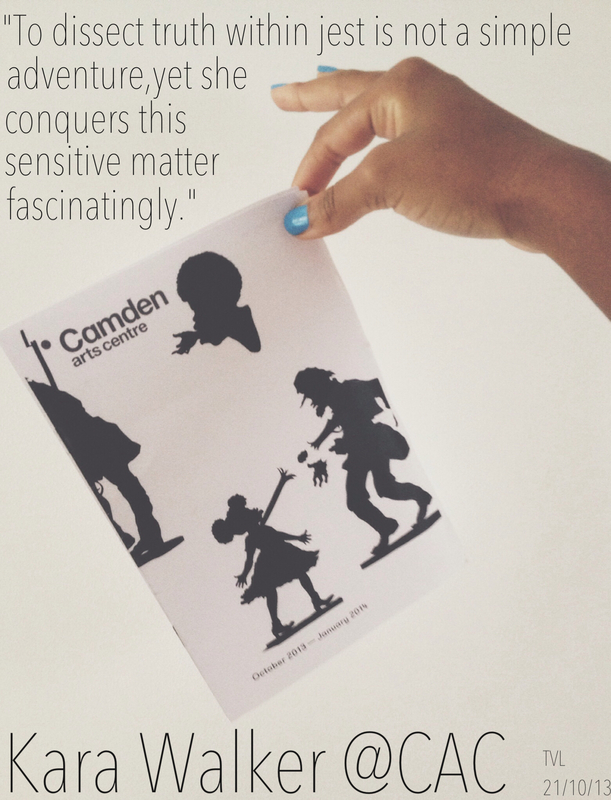 Visiting Kara Walker’s new exhibition at the Camden Arts Centre was an insightfully pensive experience. Walker is best known for her silhouette images and intent focus on race, identity and sexuality.Honestly, the entire exhibition for me was an uncomfortable viewing venture. However, this has always been her intention. To dissect truth within jest is not a simple adventure, yet she conquers this senstive matter fascinatingly. Entering the space covered in the sihouette story line images, was as though I looking through a painful black history novel. Her cunning way of presentation has always been astounding to me. She has a way of evoking emotion and reality through her story-telling and puppet show ‘humour’. I knew my attention to space and placement was going to be challenged, I therefore wanted to compare my relationship to that of the silhouette’s dimensions. I found that the lower images were at eye level, which had an essence of relatability. I believe it was this that made me feel extremely pensive as (by force) I was placed in a position of empathy. Within the sihouette space, hung a lone charcoal drawing opposite the story board. As a result of the contrast between black and white hue this created a mirror-like effect. It was as though her work was duplicated. Perhaps, double the intent? The use of space,in depth composition and subject matter hit home to me. This exhibition represents the power of Art. A must-see!